MEMOFIN - Public debt vulnerabilities in low-income countries : the evolving landscape - L'information financière que vous ne trouvez nulle part ailleurs ! 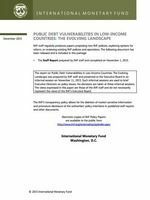 This is the first joint IMF/World Bank report on public debt vulnerabilities in low income countries (LICs). Over this period, improved macroeconomic performance in LICs, combined with HIPC/MDRI debt relief and high demand for commodities, contributed to improved LIC creditworthiness. Debt relief has been the dominant influence on LIC indebtedness over the past decade. Debt vulnerabilities remain generally lower than before the global financial crisis. Notwithstanding stronger fundamentals in LICs, heightened vigilance is needed to navigate shifting market conditions and a weaker global outlook.